Mail-In Rebate Techniques Everyone Should Know! As with coupons, manufacturers offer mail-in rebates to persuade consumers to buy their products. They’re a fantastic way to save on the things you need (as long as you remember to send in the required forms, of course). Here are a few tricks to maximize mail-in rebate savings that will change the way you use mail-in rebates at retail and grocery stores. Manufacturers offer mail-in rebates as an incentive to purchase their products. In return for buying certain brands, manufacturers will give you full or partial reimbursement. All mail-in rebates require you to buy the product first then fill out a rebate form. You’ll then have to mail the form along with your proof of purchase—typically a receipt or the UPC code from the packaging. You’ll receive a check or gift card about 4-8 weeks later. TIP: Always write legibly and follow all directions on a rebate form. If you forget something, your rebate will be rejected! 1. While you’re in the store, look for peelies and hang tags that indicate there’s a rebate for a product. Find advertised mail-in rebates on peelies (adhesive coupons or rebate offers stuck right on a product). You can also go directly to a manufacturer’s website to check for rebate offers. TIP: If you see the word “Free” printed on a peelie, grab the product! This usually means you’ll receive the entire purchase price back on the product with a mail-in rebate. 2. Or, look for mail-in rebate deals on the My Coupon Bonanza. We make finding rebates easy! Check Savings Central for deals on products with rebates. Get Free Samples of name brand products that you buy every time you shop. TIP: Find rebate deals on Savings Central. We’ll do the research and stacking for you! Available on Android and iPhone. 3. Stack coupons, sale prices, and rebate apps on top of mail-in rebate offers. Rhinocort was on sale at Walgreens for $18.99. There was also a $1 Walgreens coupon and a $6 printable manufacturer coupon. To sweeten the deal even further, a $4 Checkout 51 rebate-app offer and a mail-in rebate for the purchase price or up to $15 off Rhinocort were available. I used both coupons on top of the sale price at the register and paid $7.99 out of pocket. I then uploaded a photo of my receipt into Checkout 51 for the $4 rebate. And since Rhinocort had a mail-in rebate that was good for the purchase price of the spray ($7.99 out of pocket), I ended up with a $4 moneymaker! 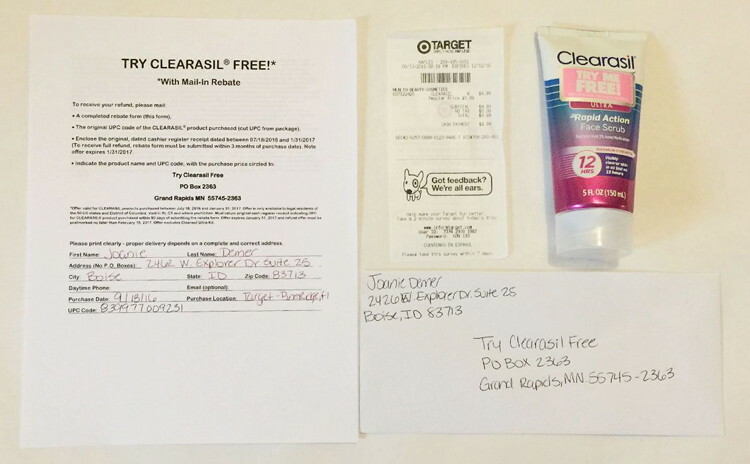 TIP: See a mail-in rebate deal at Target? Stack a Cartwheel offer on top of it for even lower out-of-pocket costs. 4. 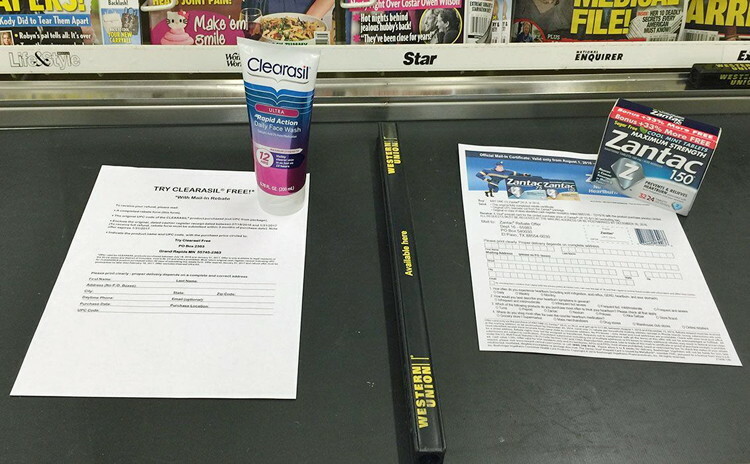 The most common grocery store rebates are for medicine and beauty products. So. many. 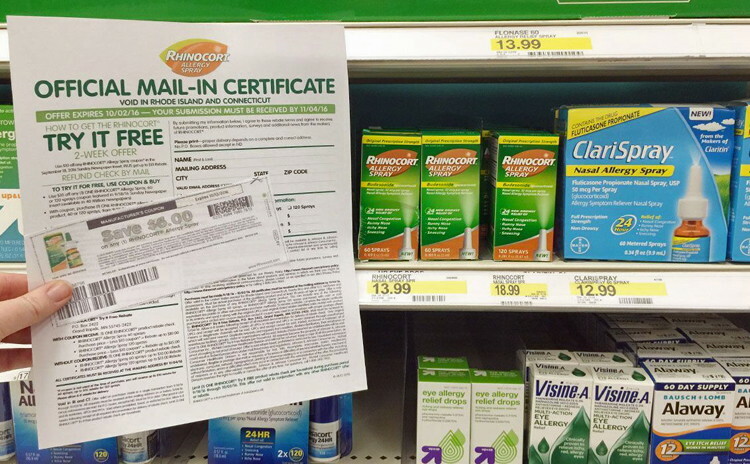 medications offer mail-in rebates…you may never have to pay for Zantac, ZzzQuil, or Rhinocort again! Seriously. Most of the time you can get these products completely free or even end up with a moneymaker. Beauty products like shampoo, conditioner, skincare products, and makeup often have rebates as well. 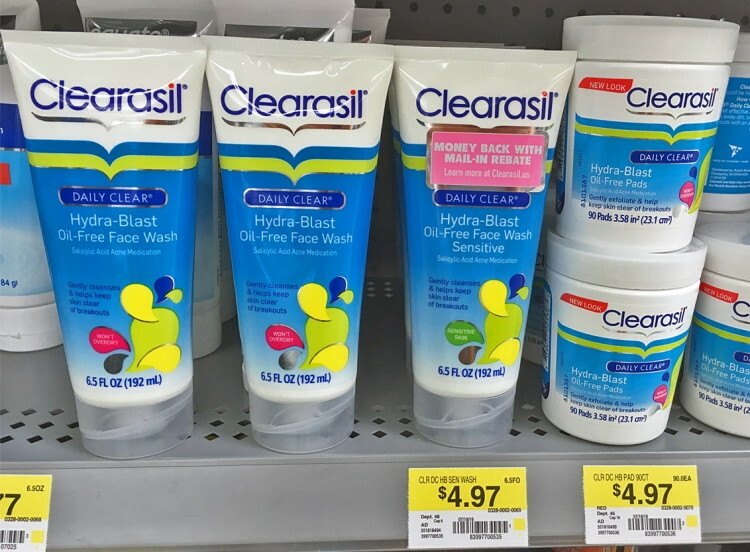 Recently, Clearasil was on sale at Rite Aid for $7.99, and since there was also a mail-in rebate, I got the product for free! All I had to do was mail my receipt, barcode, and completed form. In 10 – 12 weeks, I should be receiving a sweet check in the mail! TIP: Keep track of your rebate offers by making copies of the forms and receipts before you send them. No need to print the copies out, though. Just snap photos of the forms and keep them in a file on your computer or phone! 5. Some of the best rebate deals are on beer and wine. 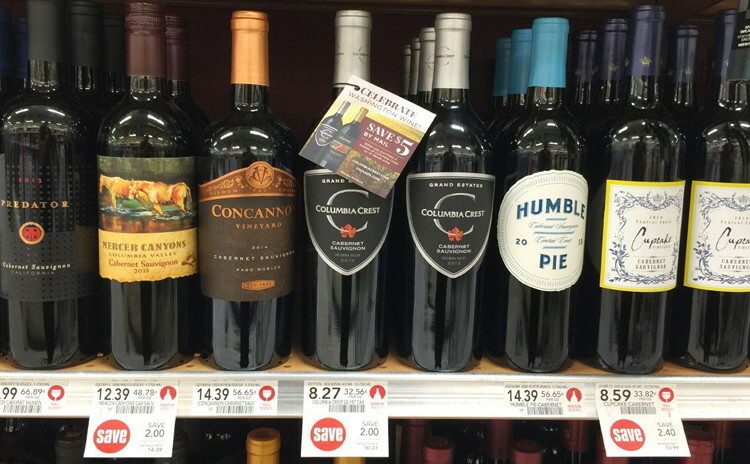 Beer and wine rebates can be found on tear pads on displays or right on the product in-store. They require the purchase of the specified adult beverage along with the purchase of certain grocery products like meat, produce, or seafood. Sometimes you just need to spend a dollar amount on groceries in addition to buying the promoted booze. One thing many shoppers don’t realize is, you can use rebate-app offers on top of mail-in rebates for alcohol! BevRAGE and Ibotta have great rebates for wine and beer. Like with mail-in rebates, just show that you purchased the specified product (by taking a photo and uploading it into the app), and cash back will be deposited into your PayPal account. Keep in mind that these 14 states are considered NBPR (No Beer Purchase Required) states: AL, AR, CT, HI, KY, ME, MD, MO, NC, NJ, NY, OK, UT, and WV. If you live in one of these states, the law prohibits rebates by alcohol companies, which means you can still receive the rebate on the groceries required on the rebate form without buying the alcohol! 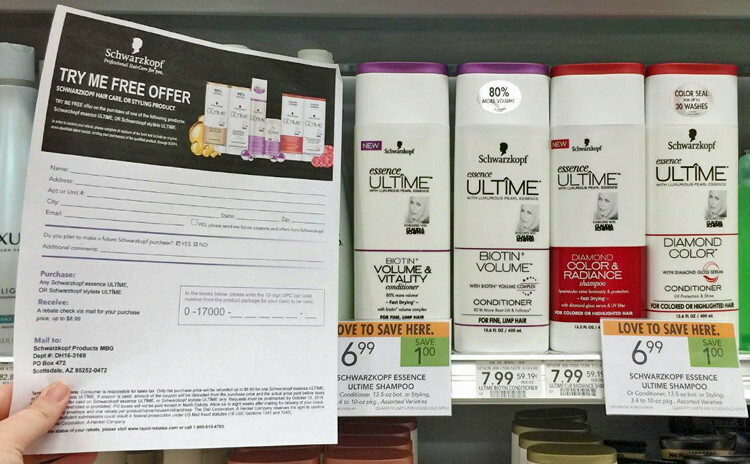 TIP: Stack mail-in rebates with multiple-bottle discounts. At most grocery stores, including Albertsons, you can find discounts on wine when you buy a specified number of bottles. For instance, “Buy six bottles of Ste Chapelle wine and receive a 10% discount.” Since Ste Chapelle frequently has mail-in rebate tags attached to their $5 bottles, I can stack the amount I’m getting back with the multiple-bottle discount and sale prices, usually making each bottle only $0.49! 6. Stack mail-in rebates with gift card promotions at your local Kroger store. Many stores (including Albertsons and Fred Meyer) have tear pads with rebate forms for beer and wine. You don’t have to buy the specified wine or beer at the store you got the form from, though. I like to get rebate forms from Albertsons and use them at Fred Meyer (a Kroger affiliate store) when they run the 4X Fuel Points Promotion on gift card purchases and stack them with these beer and wine rebates. For instance, I recently saw a Miller Lite mail-in rebate that required me to spend at least $100 at the store—plus the purchase of a pack of Miller Lite—for $20 back with the rebate. Since I rarely spend $100 on groceries at Fred Meyer, I’ll buy a gift card (like one for Amazon) worth $100 in order to take advantage of the Fuel Points Promotion and the rebate at the same time! When I did this, the beer pack required on the form cost me $14 and the rebate was for $20. So, not only did I make $6, but I also scored 400 fuel points to use for a $0.40/gallon discount (up to 35 gallons) when filling up my car at Fred Meyer! TIP: A lot of alcohol mail-in rebates have exclusions for items like lottery tickets, prescriptions, tobacco, and even gift cards. Make sure you read the rebate fine print carefully. 7. Kohl’s has some of the best rebates for appliances. Kohl’s mail-in rebates can net you up to $40 or $50 in savings for just a few minutes’ work! Rebate offers can include prepaid Visa cards, cash back, valuable credits towards future purchases, an additional appliance for free, and more. At Kohl’s, you can even earn Kohl’s Cash and use store coupons when purchasing something with a mail-in rebate! TIP: Order Kohl’s appliances eligible for a rebate online and use coupon codes for even more savings! Learn more about stacking coupon codes at Kohl’s in this article: 29 Genius (and Accurate) Kohl’s Shopping Hacks. 8. 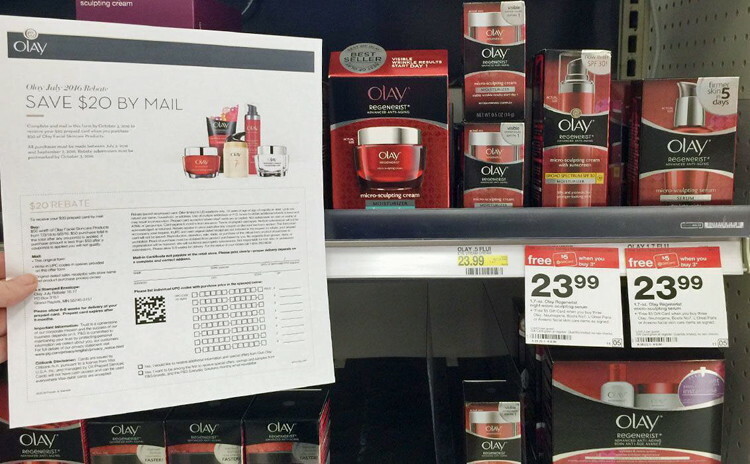 Mail-in rebates work the same for online purchases as they do for in-store purchases. Next time you buy something online on sites like Amazon, make sure you input your order number on Amazon’s Rebate Page to find out if the product you just purchased is eligible for a mail-in rebate. RebatesHQ is also a decent, but somewhat limited site that allows you to search for rebates that can be submitted electronically online. Their database isn’t super comprehensive, but it does include rebates for big brands like Bausch + Lomb, Brother, Miller, Verizon, and more. When receiving products that you ordered online, be sure to keep the packing slip/transaction information as you’ll need it to complete any mail-in rebate forms. TIP: Kohl’s isn’t the only site that allows coupon stacking online. These Retailers Allow Coupon Stacking Online as well. 9. Get free or cheap copy paper with rebates at Staples. 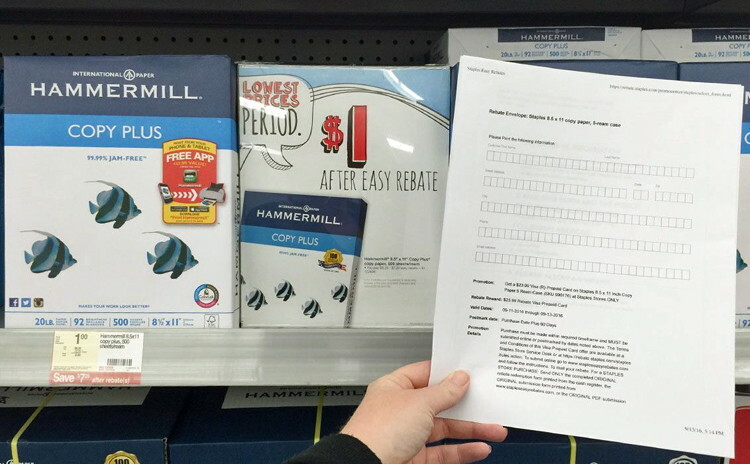 Free or really cheap printer-paper rebates tend to pop up throughout the year at home office supply stores like Staples. Printer paper is regularly priced for $8.29 at Staples, but you can often get the paper for a penny! Show the cashier the penny-paper offer coupon Staples regularly promotes, then submit the manufacturer mail-in rebate using the information on your receipt. You’ll receive a prepaid Visa card for nearly the whole amount a few weeks later! TIP: If you don’t have a Staples nearby or prefer paper delivered straight to your door, keep in mind that printer paper deals can also be found online. For example, check out this simple online deal: get a case of HP paper for only $14.99 after an Easy Rebate! 10. Purchasing more than one item that has a rebate? Separate your transactions. If on the same shopping trip, you plan on buying two products that have mail-in rebate offers, separate your transactions so you’ll have an original receipt to submit for both items. As soon as you get home, complete the rebate so you don’t forget or lose your receipts! TIP: Don’t be afraid to call. If you don’t receive your rebate in the specified time frame, call the manufacturer offering the rebate.